March is Poison Prevention Month and most every pet owner has at one point thought about or actively prevented their pet getting into something that they shouldn’t have. It’s one of the least pleasant parts of pet parenthood, sadly our furry friends aren’t always the best at knowing what they shouldn’t eat. In honor of poison prevention month we have put together this short list of some of the most common poisons to watch out for. We had an entire article about chocolate and the effects of that it can have on dogs and less commonly cats. You can find it here. The most important thing to remember with chocolate related poisoning is that it’s important to keep the sweet stuff away from your pooch or cat to prevent them from getting sick. Less common than chocolate but something that is more lethal and in almost everyone’s garage, antifreeze poisoning has been a well-known problem for dogs and cats ever since the chemical made its way into homes. Very small amounts of antifreeze can be fatal. If a cat walks through a puddle of antifreeze and then licks its paws, it can ingest enough antifreeze to cause death. Antifreeze poisoning comes in a few stages depending on how long ago the chemical was ingested. In the first half hour to 12 hours incoordination, drooling, vomiting, seizures, and excessive thirst and urination can be seen and are key signs to watch out for. After 12 hours these signs can seemingly go away, but more severe damage is happening inside of your pet. In the last stages severe kidney failure is likely occurring and signs of lethargy, drooling, vomiting, seizures, and coma can be seen. The best way to avoid antifreeze poisoning is to put the chemical away and out of reach when not in use. It is also helpful to dispose of it properly and not to pour it on the ground, as your animal can walk in or drink it. Contact your vet immediately if your pet ingests antifreeze as it is incredibly harmful for your pet. 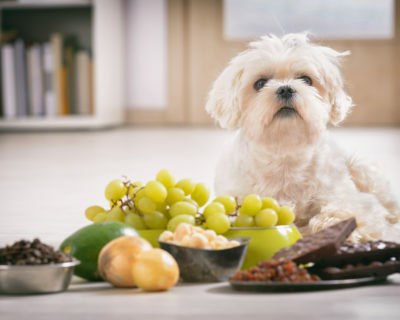 While grapes and raisins are a delicious healthy snack for you, they have a well-documented history of causing severe problems in dogs. Veterinarians still aren’t entirely sure what chemical compound in raisins and grapes is so toxic to dogs, but the effects of the poison are well known. The compound can lead to debilitating symptoms such as vomiting/diarrhea, loss of appetite, lethargy, abdominal pain, and a whole host of kidney and urination issues. Grape and raisin ingestion can culminate in severe kidney failure in your pet if left untreated. If you know that your dog has recently ingested grapes or raisins, then a majority of vets recommend that you induce vomiting as soon as possible and contact your vet for further advice. Do no induce vomiting if your dog is already vomiting or is not conscious after eating the grapes or raisins. There is little information on if grapes or raisins are equally harmful to cats, their lack of sweet taste receptors make them less likely to eat food’s like fruits. A beautiful and easy to keep plant, Azaleas can cause serious issues within your pet if ingested, which can be an issue if your dog or cat is a plant chewer. These plants contain grayanotoxins which disrupt sodium absorption affecting the skeletal and cardiac muscle. Both the flowers and stem of the plant are considered to be poisonous to animals when ingested. Experts believe eating as little as .2% of the pet’s body weight can have negative effects on your pet, especially dangerous for small cats and dogs. Early signs of Azalea poisoning are vomiting, diarrhea, drooling and abdominal pain. If left untreated or if a large amount is ingested severe heart complication, seizures and coma can occur. You should attempt to induce vomiting and contact your vet if your pet has eaten some of your Azaleas. One of the easiest ways to prevent this poisoning is to avoid keeping the plant if you know your pet is prone to plant chewing. If the plant is outside, then fencing can help prevent your pet from access to the poisonous plant. It’s important to note that there are dozens of other household plants that can be poisonous to your pet, always research any plant before you purchase it, a splash of color in your home is not worth your pet’s health! Another item that can be found in nearly every home either as part of a medical routine or simply to deal with headaches on a bad day. While Aspirin overdose is possible in humans if taken in excess it is even easier for dogs and cats to ingest a dangerous amount of aspirin. Cats are more susceptible to poisoning from drugs like aspirin as their liver has a harder time processing the chemical. Signs that your dog or cat have ingested too much aspirin include vomiting, diarrhea, vomiting of blood, black-tarry stool, breathing problems, and can eventually lead to kidney failure. If you know your dog or cat has ingested a large amount of aspirin, then immediately contact your vet since it can be a serious poison if left untreated. The easiest way to avoid your pet getting into aspirin is to make sure to reseal the child proof cap and put it away to prevent the bottle of tablets from spilling. The list that we have here is in no way a complete list of every substance around your home that can be poisonous for your pet. It’s important to monitor everything that your cat or dog puts in their mouth. If you are unsure if a substance is toxic to your pet, then there are many online resources you can access and of course you can call your vet. An ounce of prevention can save you from worrying and can save your pets life.